It's day 1 of My Creative Time's 72nd Edition Sneak Peeks! I'm just loving this release, and I think you will too! Today we are showcasing the new Sweet Candy Cane Die and Stitched Candy Cane Background sets! For my project today, I thought it would be fun to make a card with a big mug of hot chocolate on it. The new Sweet Candy Cane Die makes a nice big candy cane, that is the perfect size for my mug! I had to make a pretty large card (5 1/2" x 6 3/4") to fit this. For the mug, I used the You Deserve a Break set. I love the little marshmallows that come in this set too. They look so cute paired with the candy cane! And now that I've embossed the mug with the Stitched Candy Cane Background, I want a set of these in real life! For a finishing touch, I added a little tag, using one of the Fun Stitched Tag Dies. I heat embossed a sentiment from Mini Christmas Greetings and added a few hearts made with dies from 4x4 Journal Die + More. I hope you enjoy these new sets as much as we do! OMG Miss Katie...You so created one Super Spectacular Card! 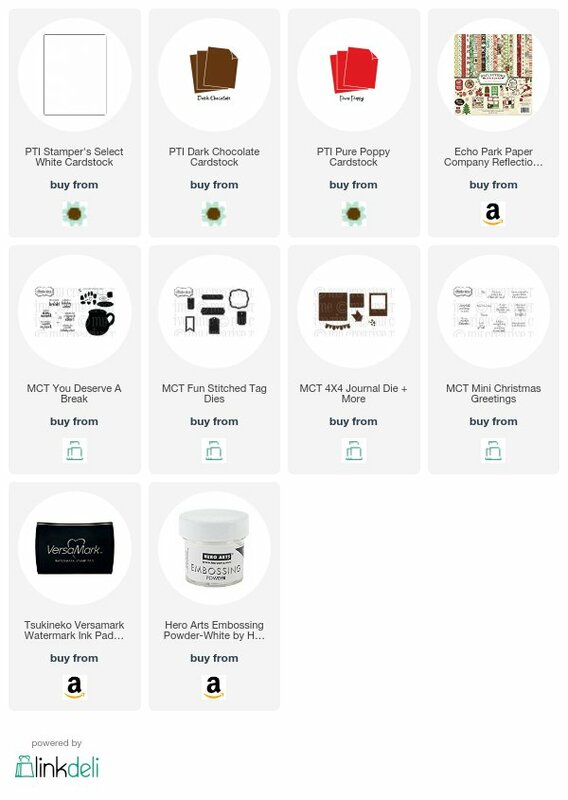 Your idea for the Hot Cocoa definitely showcases today's sneaky peek in one Magnificent way....Your designer mug is Fabulous and can't think of a better way to have a cup of cocoa than with a candy cane it w/ the mellows!! You so did a Super Outstanding Creative job!! YOU so ROCK!! Oh how cute, love how you used both sets of dies, super cute! Have a blessed and crafty day! Your cup of Cocoa is super adorable!! I think you did a fab job!! 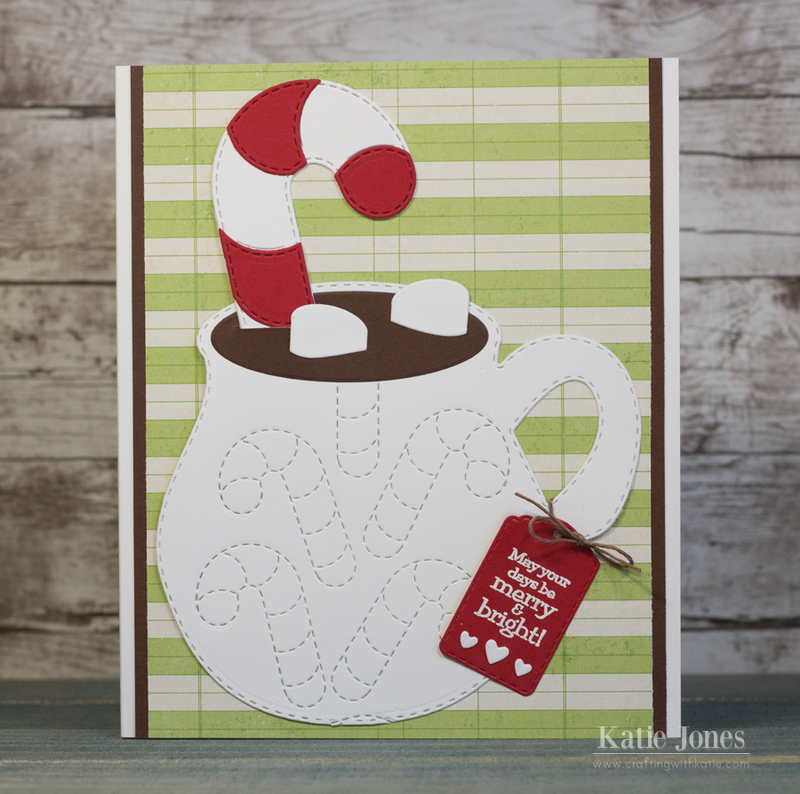 Your cup of cocoa card is so cute and what better way to use a candy cane. I'm lovin it! OMG this is super cute!!!!! I really love that you used the candy cane background to give the mug a nice design! Love that you dipped the candy cane into the hot chocolate! We actually do that every year too with ours!!!! Love the peppermint taste in our hot chocolate! Love this! I love your idea to use the mug die...so cute with the background die. Beautiful card! The little tag is great for the sentiment. So cute! LOVE that you used the candy cane die for the design on the mug. So fun and cute! What a cute card! I love this mug and it is great paired with the new candy cane die and stitched background on the mug! Great job. awesome idea!!! somebodys thinking out of the box!!!! I love it so pretty!!! Great use of the different sets! The candy cane background die worked perfectly as a mug decor! I love that card! It's so adorable. This is such a cute release. Your cocoa card is so creative and cute. What a great use of the Candy Cane. The candy cane in the hot chocolate is absolutely adorable. I makes you wish it were that season right now.